San Francisco startup AppMesh is emerging from stealth mode with iPad(s aapl) and iPhone apps that bring together and optimize salespeople’s inboxes, calendars and ongoing deal data sets. With the apps, getting lost in email and manually updating the sales process are things of the past, the company vows. Co-founders Leo Tenenblat and Tom Tobin both worked in product management on analytics at Software-as-a-Service (SaaS) giant Salesforce.com(s crm), where they saw the value of pushing out clear information to salespeople’s mobile devices. With AppMesh, updates sync quickly between the iPad app and iPhone app. And if an app goes offline, it will sync and replicate to the Amazon (s amzn) Web Services public cloud once it goes back online. Users can export Salesforce data to the apps, although importing back to Salesforce is not currently possible. Android versions are planned. The apps automatically take note of salespeople’s emails and phone calls to potential clients. It also arranges email in different ways — by the size of the deal, by the time the deal opportunity closes and so on. The apps are free for teams of up to five people, and prices are determined on a case-by-case basis for larger user groups. 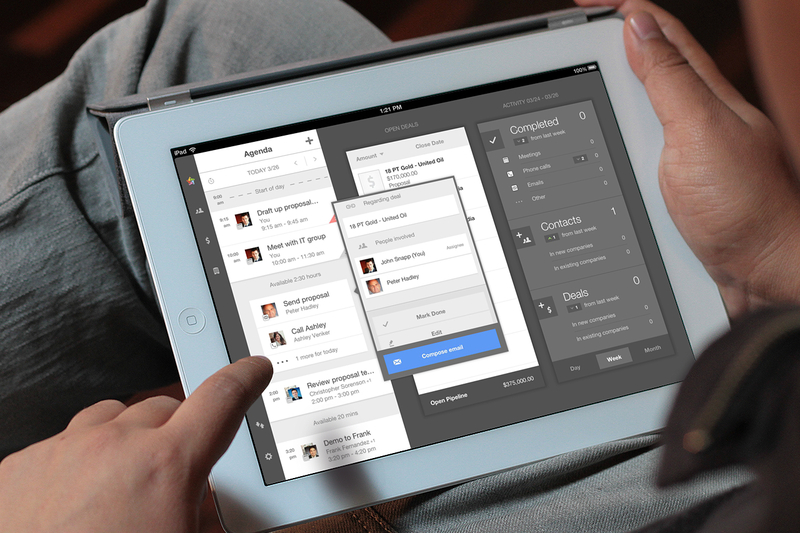 The AppMesh application for iPad lets salespeople track meetings, sales opportunities and emails. The product is similar in some respects to Tylr Mobile, a startup that’s still in stealth mode. Meanwhile, some startups, such as Crushpath and Selligy, offer mobile apps for tracking sales relationships, and others, such as Yesware, deal in optimizing salespeople’s email boxes but not with mobile apps. There are also startups that aim to make the best of email but don’t draw from sales apps, such as Taskbox and Mailbox, which Dropbox acquired. On top of that, it’s possible Salesforce itself could roll out more sophisticated features. After all, Salesforce plans several announcements around mobile offerings this year. Then again, Salesforce could move to acquire AppMesh or Tylr Mobile. The deal would make sense, because the products are intended to solve a real problem for salespeople.